Rosalie Coschignano/Contributing Photograper Information Technology Services directors and project leaders present on upcoming improvements, including their Identity and Access Mandate, which aims to consolidate multiple email addresses for one person into one account. 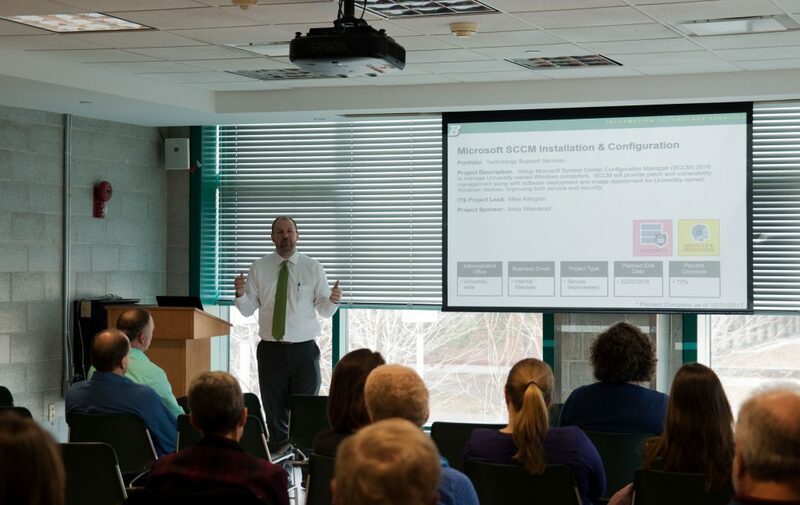 Binghamton University’s Information Technology Services (ITS) directors presented upcoming projects to students, faculty and staff on Wednesday morning. In 2016, ITS instituted its Project Management Office to manage and develop its project portfolio and evaluate project requests. In fall 2017, the PMO held its first project briefing, which spotlighted projects from Jan. 1, 2017 through July 31, 2017. Throughout 2017, ITS received 107 project requests, which are ideas for new technology services or programs submitted by the University community, and completed 81 of them. After a project is selected for development, it will have a technology lead and a sponsor. A sponsor oversees the development of the project and will manage any obstacles that may arise. The technology lead will be the technology expert for the project from ITS. According to Logan Robinson, communications manager for ITS, the briefings provide transparency on the projects ITS is developing. “This venue provides an opportunity for feedback and discussion around the highlighted projects in the presentation,” Robinson wrote in an email. Wednesday’s brief highlighted six projects in development. The six projects funded by the University include the identity and access mandate; Microsoft system center configuration manager; National Institute of Standards and Technology 800-171 “bubble” implementation; business intelligence software implementation; the distributed antenna system; and a project for outdoor Wi-Fi. The identity and access mandate aims to consolidate multiple accounts for one person into one, which could be especially helpful for emails. After people change jobs or roles at BU, their email accounts are often switched, leading to one person having multiple email addresses. The project hopes to eliminate this and create one account for each person. In the meantime, the National Institute of Standards and Technology 800-171 project aims to create a “bubble” for faculty to perform research and will act as a short-term solution for faculty research until the identity and access mandate project is completed. Microsoft system center configuration manager will provide a centralized service for software deployment, patch management, anti-virus management and remote assistance for Windows devices owned by the University. When completed, several new full-time employees will be hired to monitor the program. Business intelligence software implementation is a software project that will provide data reports and performance dashboards from University databases. It is expected to be completed by April 2018. The distributed antenna system and outdoor Wi-Fi will extend current infrastructure and services on campus as part of BU President Harvey Stenger’s Road Map program. The system will provide cellular reception to places on campus that are not well-connected, including Academic Building A, the University Union and Glenn G. Bartle Library’s ground floor, while the outdoor Wi-Fi project aims to provide internet connectivity to places such as the Spine and the Peace Quad. Some attendees expressed their concerns over budgets and the accessibility of some of the projects to all departments at BU. Andrea MacArgel, director of instructional design for the Center for Learning and Teaching, said she would like to see more educational projects. Project briefings occur once every semester. The next project briefing will be in September 2018.